This BMW X5 is available in Silver, Black, White, Red, Blue other colours and lease options, subject to availability and includes a warranty. If you want a big 4x4 that drives more like a sports saloon, the BMW X5 is the one. It’s impressively swift, yet still manages impressive fuel economy and has lower emissions than the rest of the range. Brilliant to drive on the road and pretty good off it. Economy is impressive if you choose our favourite model, the 3.0d SE. Few big 4x4s drive as well as the X5. It's more agile than such a big 4x4 has any right to be, with strong performance and good economy. Available with 7 seats. Which BMW X5 are you going to lease today? We offer top quality BMW X5 from brand new, nearly new, slightly used or ex demo, whether you have good or poor credit rating, pay a low or no deposit. These BMW X5 can be leased or financed and come with a warranty, HPI checked and when contract hire leasing, include UK nationwide delivery and AA or RAC Roadside Assistance cover for peace of mind. 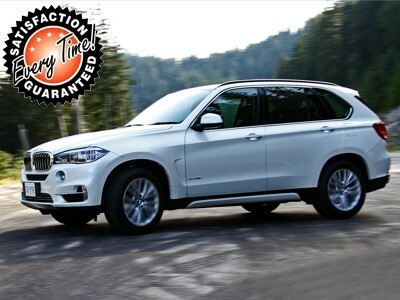 Time4Leasing can offer you the latest BMW X5 lease deals at lower prices because these vehicles are exclusive and offered at lower rates to customers that have good, poor or even bad credit history score ratings. If you want a big 4x4 that drives more like a sports saloon, the BMW X5 is the one. Which is best? We can’t see any reason to look beyond the 30d. It’s impressively swift, yet still manages impressive fuel economy and has lower emissions than the rest of the range. The more powerful 40d and M50d diesels are quicker and not much less economical, but they cost a lot more to buy. The 402bhp 50i is utterly crazy – brilliant, but you'll need a Premiership footballer's income to buy and run it. There’s a choice between two trim levels. To most eyes, the aggressively styled M Sport model looks better than the entry-level SE. However, the sports suspension hurts ride comfort. We’d save a few pounds, enjoy cushier suspension, and take the SE. It’s worth buying the BMW Service Inclusive package, which covers servicing costs for five years/60,000 miles for a one-off payment and helps keep resale values healthy. There are 41 BMW X5 Lease Deals on Offer.